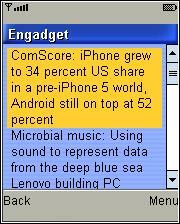 An RSS News Reader app. It keeps track of read and unread items and supports RSS and Atom feed formats, importing RSS feed lists from internet or phone memory (not tested) and opening links in the phone browser. Opening links works with my Motorola Rambler but the app has to close to launch the browser which a phone limitation not an app one. The app does not display the images in feeds. To find more feeds, Google “Site Name RSS feeds” where site name is the sit’s whoese feed you’re seeking. The app “RSSReader” (92 KB) is ready to download or send to your phone as filename: “RSSReaderTL”. What does this have to do with Mobile RSS Reader? Please don’t post off-topic comments. I’ll look at the game and post it works and it’s not warez. Both are commercial games that aren’t supposed to be free. I can’t post them here.